As I have increasingly less and less time to go to various websites, it is frequently the case that I do not learn of various developments in the counterfeit church of conciliarism until a friend sends me a news item that he has found online. Believe it or not, I am trying, despite all of the recent and as of yet ongoing medical tests, to put out several anthologies of the articles that have appeared on this site. I have little time to go “surfing” on the internet when I am home, which is a location that I have not spent a lot of waking hours at lately. The peace of this First Sunday of Advent was interrupted by an email from a friend, who sent me a post found on the sedeplenist, anti-sedevacantst Rorate Caeli website (I can’t remember the last time I volitionally went to that site) that is completely unsurprising. Yes, the Argentine Apostate can answer questions to put to him by his “bishops,” but only if they give him the opportunity to endorse their perfect understanding of what he, “Pope Francis,” intends to accomplish. What Jorge Mario Bergoglio considers merely “irregular situations” have been condemned repeatedly by the authority of the Catholic Church. Amoris Laetitia. The Buenos Aires “bishops’” “authentic” interpretation of it makes a mockery of the martyrdom of numerous saints and the zealous work for souls by such missionaries as Saint Francis Solano and Saint Anthony Mary Claret. Obviously, those who accept Jorge Mario Bergoglio as a true and legitimate Successor of Saint Peter must adhere to what he teaches without dissent. A true pope has the power to bind the consciences on all men on the face of the earth concerning the precepts of the Divine Positive Law and the Natural Law. As has been noted at least a dozen times before on this site, the late Monsignor Joseph Clifford Fenton, who was the much-respected editor of the American Eccesiastical Review from 1943 to 1963, condemned those who employ “tricks of shoddy minimism” to reject the teaching of the Vicar of Our Lord Jesus Christ on earth:. The internal acceptance which Catholics are bound to give to that portion of the Church’s teaching not presented absolutely as infallible is described as a “religious assent.” It is truly religious by reason of its object and of its motives. The Vatican Councl’s conclusion to its ConstitutionDei Filius stresses the religious object of this assent. The faithful are reminded of their obligation to believe the doctrinal pronouncements of the Roman Congregations because these statements denounce and forbid definite errors which are closely connected with “heretical wickedness” and which thus are opposed to the purity of the faith. Teachings that contradict errors of this sort are obviously religious in character since they deal more or less directly with the content of divine revelation, the body of truth which guides and directs the Church of God in its worship. Unfortunately for those who believe in the resist while recognize position that is just a recrudesence of the Gallican heresy, the One responsible for the formulation of dogma is the Third Person of the Most Blessed Trinity, under Whose infallible protection popes teach the truths of the Catholic at all times, yes, even when not proclaiming something solemnly ex cathedra. Catholics are bound to obey everything proposed by a true and legitimate Successor of Saint Peter without any degree of dissent, reservation or qualification. Monsignor Joseph Clifford Fenton proved that this is so in his scholarly treatises cited above. Jorge Mario Bergoglio has caused his previously unofficial letter to the "bishops" of Argentina affirming the correctness of their interpretation of Amoris Laetitia as the only "authentic" to be inserted into the Acta Apostolicae Sedis. It's now the "official" teaching of what those in the resist while recognize movement believe to be the Catholic Church. Ah, as we know, however, such a teaching cannot come from the Catholic Church, only from her counterfeit ape. The Argentine Apostate is not the problem; he is but a vulgar manifestation of a false church that is the work of satan himself. The fact is, of course, that Jorge Mario Bergoglio is not a Catholic and hence not a true and legitimate Successor of Saint Peter as to claim that Our Lord came to “free” us from the “rigidity” of the “laws” is to say that Holy Mother Church was an instrument of oppression and enslavement prior to the “Second” Vatican Council. It is to say that the Catholic Church and those who defended the Sacred Deposit of Faith that Our Blessed Lord and Saviour Jesus Christ entrusted exclusively to her for Its infallible explication and eternal safekeeping has erred and is not infallible. 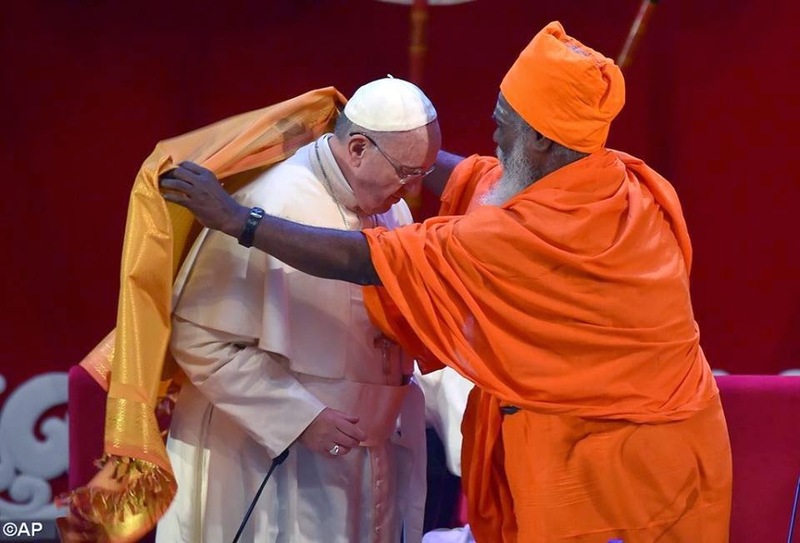 Bergoglio’s “healthy realism” is simply a way of excusing adherence to error and an unrepentant persistence in Mortal Sin as “realistic” as it is “impossible” to adhere to the totality of the Faith or to be “perfect” in one’s personal conduct. May we cling to Our Lady, especially through her Most Holy Rosary, in this first week of Advent as we beg her for the graces to stand steadfast in truth in these terrible times without any degree of doubt about the simple fact that a heretic cannot be a true and legitimate Successor of Saint Peter and that it is necessary to separate ourselves from the false church of conciliarism with its false liturgical rites and blasphemous, heretical "teachings" and pastoral practices.